For my bone study, I chose a pencil crosshatch drawing of a skull and a leg. Of course, in reality, the skull isn’t connected to the leg bone. My intent was to create a piece that appears plausible at first glance, but looks just unnatural enough to make the viewer look twice. By positioning the bones in a fashion that makes them align perfectly, it appears as though the femur is attached directly to the base of the skull. 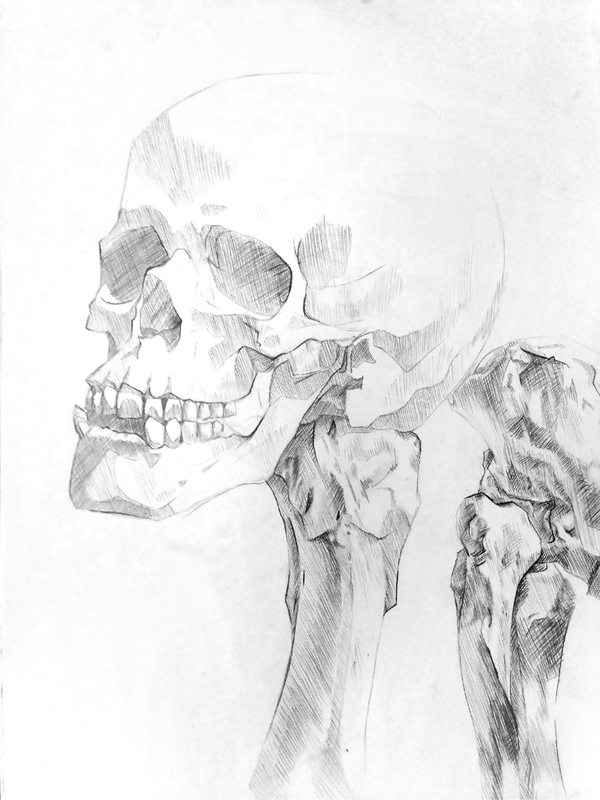 The majority of the in-class bone drawing was spent perfecting the crosshatching technique as shading as well as learn to draw the uneven shapes. I chose to use crosshatching to create texture; bones aren’t very smooth, and I felt smooth shading would not convey that properly. Value is easy to create with it; closer, thicker hatches appear darker, while lighter, spread out lines appear light. I also frequently use crosshatching in my sketchbook drawings, so using it in a piece allowed for me to use that skill. The lines are drawn with various weights; sections of bones that jut out and areas that are closer to the viewer are drawn with thicker lines, while areas that are farther away fade out- the crown, for example, has to be implied from the shape of the skull. In fact, not all of the topography is shown with lines; a lot must be implied through the shading. Most of the leg is cropped out of the drawing. Had I drawn the entire leg, the details of the skull would have been too small to see, let alone draw, and the piece would have lost its effectiveness. Instead, I placed the eyes of the skull on the line of thirds’ intersection and drew only the top of the femur, the bottom of the fibia and tibia, and the heel of the foot. The pose and of the foot bone makes it clear that it is a foot without the viewer having to see the whole thing. Having done this project, I now understand a lot more of the underlying structure of the human body. Certainly I could continue to draw noodle arms in my sketchbook or as a stylization, but knowing the basics is the first step to being a better artist. Along with that, being able to make the unrealistic appear realistic is a good skill to have when working with fantastic subjects. This entry was posted in Non Time-Based and tagged 18"x24", Bone Study, Figure and Motion, Graphite. Bookmark the permalink.